Hi! 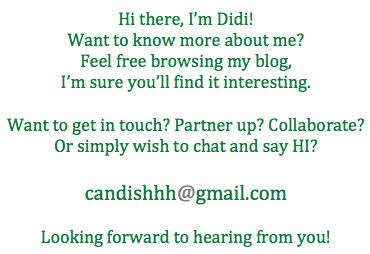 I'm Didi, I love to talk, I love to eat, I love ballpens, I like to travel (I super LOVE Japan!) and now I'm a mom to three kiddies! Since becoming a mom, I've realized that breastfeeding is not for everyone. I don't judge formula feeding moms, as I was formula fed when I was a baby and I turned out wonderful! Haha.. You can read through my blog and see the changes that happened in my life. I started this blog in 2005 (YES, thaaaaat long ago!) to just document my thoughts and food discoveries and to share recipes and stuff and now it has evolved into a mommy blog with everything under the sun thrown in. I didn't realized that I wanted to continue on, but you know what - I need an outlet really and my fingers do the talking. Well, actually my brain AND my fingers. Hahaha! Please do drop by often to and eavesdrop on my whatever thingies. If you want to advertise, be featured, make a guest post, host a giveaway, sample out a product or simply just want to chat - I'd love to hear from you! Please feel free to send me an email so I can reply back soonest! What is happening to my body? !